Louisiana Gov. 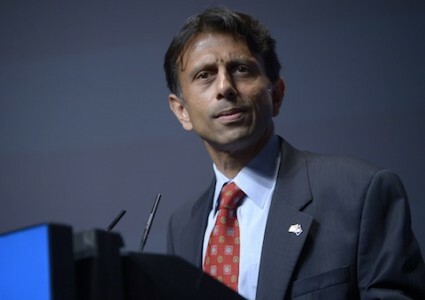 Bobby Jindal (R.) filed a lawsuit against the Obama administration over Common Core Wednesday, arguing that the government's role in pushing the standards on states threatened states' rights and abused federal funds. Although proponents of the standards depict them as "a state-led effort," states adopted the standards in order to qualify for federal Race to the Top funding. Without directly naming Common Core, the federal government required states to implement standards with a list of attributes mirroring those of the newly-minted Common Core standards. Forty-five states then switched to the standards with little to no review or public debate. Jindal is suing the Department of Education over this requirement, citing U.S. laws that forbid the federal government from controlling school curricula. According to Jindal's case, states should be able to keep Race to the Top funds without retaining the standards or Common Core-aligned standardized tests. The push for national standards was "in contradiction to 50 years of congressional policy forbidding federal direction or control of curriculum, the cornerstone of education policy," the lawsuit reads. Jindal supported the standards in 2010, but since then a massive backlash against the standards and concern over his own son's math homework has prompted him to review his position. He now says the program "effectively forces states down a path toward a national curriculum." Jindal attempted to repeal the standards earlier this year by executive order, but a Louisiana court struck his action down. The judge said Jindal's order would cause "irreparable harm" and initiate "a state of chaos" in Louisiana schools. Much of the controversy over Common Core hinges on to what extent standards drive curriculum. Supporters of Common Core argue that fears of the federal government pushing a "national curriculum" are unfounded, since the program merely sets standards and leaves educational content up to the schools. But opponents counter that the line between standards and curriculum is fairly thin, with the former inevitably shaping the latter. Jindal said in a statement that Common Core's crafters should "finally admit they want to control curriculum. These are big government elitists that believe they know better than parents and local school boards." The lawsuit claims the standards "started as good state intentions" but have "materialized into the federalization of education policy through federal economic incentives and duress." It charges that these good intentions and the "voluntariness" of participating in Common Core-aligned testing "have proven to be illusory." Jindal's opponents have already begun spinning the lawsuit story as a disingenuous political move on the governor's part. The president of the Fordham Insitute, which has been at the forefront of defending Common Core, said Jindal will lose this case "just as he’s lost the others", and that "It’s about Jindal’s political ambitions." Anne Hyslop, a senior policy analyst for Bellwether Education Partners, told Politico, "It’s unlikely he’ll get anything out of this suit other than padding his conservative credentials — which may be the whole point." The Washington Post writes: "Louisiana Gov. Bobby Jindal (R.) just sued the Obama administration. He had to." "As an early champion of Common Core," the article goes on, Jindal needs the lawsuit to stifle criticism in a presidential primary. Education historian Diane Ravitch, who has also lashed out at Campbell Brown's attempts to reform teacher tenure, asked Wednesday morning, "Is Jindal Hoaxing Us?" Ravitch suggested Jindal's opposition the standards amounts to "political machinations." The Cato Institute's Neal McCluskey rebuked Common Core supporters for making the argument about Jindal's motives, saying that regardless of his intentions, "We should look at the merits of the lawsuit, which requires an honest assessment of both the Constitution and federal education statutes, just as we should look at the research on national standards, the content of the Core, and the reality of how so many states adopted standards that are now heavily disliked. Do those things, and I think the Core loses hands down." The Department of Education has not yet commented on the case. Secretary of Education Arne Duncan has questioned the sincerity of Jindal's position Common Core in the past. National support for Common Core dropped sharply in the last year, both among teachers and the general public. At the same time, an increasing number of Americans say they object to heavy federal involvement in public education.